Fiona is CEO and Creative Director of The Space, the organisation founded by the BBC and Arts Council, England to support artists and organisations to make great art and reach new audiences digitally. She’s worked extensively with arts organisations and artists from around the UK producing films for UK broadcasters, online and cinema and since joining The Space has commissioned a wide range of projects including Complicite’s The Encounter (winner The Stage Innovation Award 2017), Artichoke’s London 1666 and the award-winning VR experience from 59 Productions My Name is Peter Stillman (Best Expanded Animation, British Animation Awards). Fiona delivered the world’s first live 3D opera, Mike Figgis’ Lucrezia Borgia, a 3D worldwide cinema release of Matthew Bourne’s award winning Swan Lake, co-produced the first live museum broadcast from the National Gallery Leonardo exhibition and produced a two-part documentary following the creation and presentation of Michael Sheen’s Port Talbot Passion. Sourcing free railway sleepers to shore up the floor of an Edinburgh fringe festival to stop the audience seating falling into the basement. The lack of dedicated iterative public funding to encourage early stage innovation and experimentation. Being able to make a good cup of tea, most situations are improved with provision of a decent hot beverage, resourcefulness – those railway sleepers didn’t find themselves, a fond and enduring sense of the absurd, regularly demonstrated by the conflict between the human tendency to seek inherent value and meaning in life and the human inability (sometimes) to find any. Find railway sleepers…. and work out how to transport them on the roof of a Citroen 2CV. The abiding privilege of loving my job! Consult and collaborate with colleagues but remember if a decision rests with you then first and foremost you need to believe in the process and outcomes you choose. 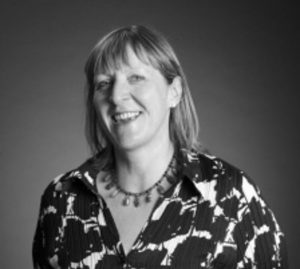 Fiona will be delivering the Big Ideas Talk: Doing Digital? you can follow her on Twitter here.